Beware: Slow death is sweeping across North America. Well, at least it is among elite walleye pros who ply the tough tournament circuits and rely on cashing big cheques to pay down their mortgages and put food on the table. Fear not, however—this isn’t some sinister new epidemic. But as the latest killer tactic in the world of walleye fishing, slow death is definitely catching on. Here’s what you need to know to join the action. Every summer, however, Spaid and his fishing partner, Brett Cheddar, would hit a slump on their home water, the Missouri River, when the walleye would stop hitting their bouncer-and-spinner combinations. The problem? In order to make the blades spin, they had to troll quickly, which was too fast for the lethargic fish. So one summer, Spaid removed the blades and trolled with just the beads, two hooks and a crawler. It worked—for a while. “But by the full moon in August, when the water was really warm, even that faltered,” he says. Undaunted, the pair modified the rig even further, ultimately discovering the critical component: pulling nothing but a simple #2 Tru-Turn Aberdeen hook, with its unique 45-degree kink in the shank. They then threaded on a nightcrawler, giving it the distorted shape of the shank, and pinched off the trailing end so only a small, smelly nub hung off the back. When Spaid and Cheddar trolled the strange-looking rig behind a bottom bouncer at moderate speeds, to their amazement the bait rotated in a corkscrew fashion, enticing more and bigger walleye than any other tactic they’d tried. Then along came the 1990 Governor’s Cup, one of the most prestigious tournaments in walleye angling, with 200 of the top touring professionals converging on South Dakota’s Lake Oahe. A few days later, those same pros snuck out of town with their tails between their legs, humbled by Spaid and Cheddar—who, incidentally, had never fished a tournament before. Armed with their modified rig, the duo humiliated the field again in 1994 and 1996. Gary Parsons, the most successful professional walleye angler of all time, is also quick to praise Spaid. According to Parsons, the tricks of regional guides rarely catch on at the elite tournament level. But after Spaid shared his technique with Parsons and tournament partner Keith Kavajecz, the duo used it to win tens of thousands of dollars. While Parsons and company tried to keep the slow-death secret under wraps, amateur tournament partners were eventually exposed to the technique, and before long, loose lips were sinking walleye ships everywhere. Today, says Parsons, up to 90 per cent of the pros at any given walleye tournament will be experimenting with slow death. Which raises the question, why does it work so well? “It bridges the gap,” says Parsons. “The Lindy Rig, with its single hook, long leader and slip sinker, is the ultimate presentation when you’re fishing the spot-on-the-spot. But it’s the slowest of all walleye presentations, so you have to know you’re on a concentrated school of fish to be successful.” The next step, he says, is skewering a live leech, nightcrawler or minnow on a single hook and dragging it behind a bottom bouncer. With this set-up, you can troll at speeds up to 7/10th of a mile an hour. But then there’s the gap. Before slow death came along, the next logical step up the walleye tactic ladder was pulling a bottom bouncer-and-spinner combination, which you need to troll at 1.1 to 1.2 mph. Slow death fills that divide, providing erratic, darting, fish-triggering action at any speed, which is particularly useful when spinners and Lindy Rigs just won’t do the job. Plus, there’s no hardware to spook cautious walleye. While slow death may seem revolutionary the first time you try it, remember that Spaid, Parsons and Butts have been quietly employing the technique for a decade or more now. So there’s much you can learn from their trials, tribulations and constant experimentation. “The weight of the Tru-Turn Aberdeen hook is critical,” says Spaid. “It’s light and it spins at any speed.” So if you’re trolling along a contour line with slow-death rigs out both sides of the boat and you make a turn, the inside line pauses and the lure flutters down enticingly. And if you pop the engine into neutral, the crawler won’t hang up. 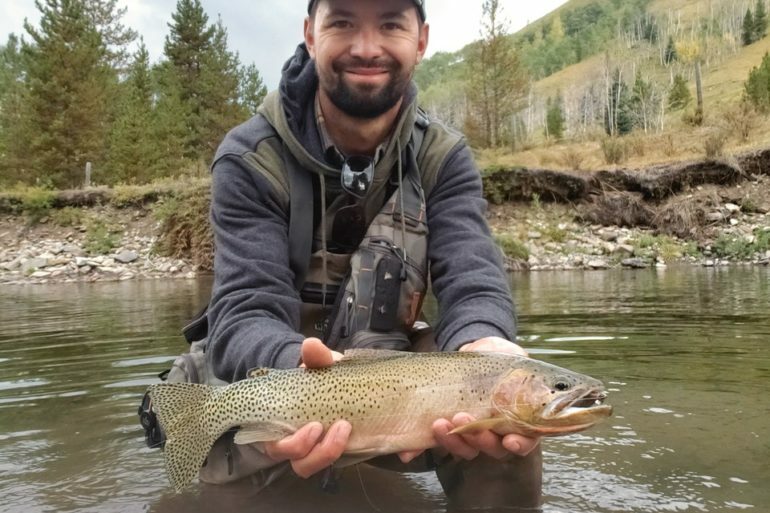 Spaid uses blue and bronze Tru-Turn hooks in deeper water since they’re slightly heavier than the gold ones, which he uses in shallower water. Parsons can’t remember how many different hooks he bent, but he eventually settled on a version that worked particularly well, and for more than a year he bent hooks for all his closest allies. In 2002, the rig paid handsome dividends at the PWT event on Wisconsin’s Lake Winnebago. The bite during practice was horrendous, but three days before the tournament was to begin Parsons started nailing walleye using the slow-death technique. He told his son—fellow tournament pro Chase Parsons—and team partner Kavajecz about his success, and all three started using it. Whether you follow Spaid’s pioneering lead and use the original Tru-Turn hooks or one of Parsons’ Mustad versions with its more pronounced bend—which Butts now uses, by the way—all three walleye hounds insist a balanced bottom bouncer is crucial. It keeps the gyrating crawler up off the bottom and at eye level with the fish, and when it ticks a rock or log, it imparts action to the worm, jerking it forward then causing it to pause. That’s usually when a walleye will strike. To help get walleye to bite on windy days, Parsons and Spaid favour sliding bottom bouncers. Spaid also uses a sliding bouncer when the walleye are fussy. Butts, on the other hand, ties on a sliding Fin-tech Tech Stik when he’s facing such conditions. The unique snap-on, snag-less sinker lets him experiment with different weights—usually between one and two ounces—until he finds the ideal set-up. The key with the weight is to remember the 10-foot rule. One-ounce bouncers and sinkers are ideal in waters up to 10 feet deep, two-ounce models are the ticket at the 20-foot level, while three-ounce weights work best to get down to 30 feet and deeper. These are only general guidelines, though. Spaid sometimes fishes a one-ounce bouncer in 40 feet or more, for instance, because it forces him to slow his trolling speed. The leader you attach to the bouncer is also critical. Spaid exclusively sticks with eight- to 10-pound-test Maxima Ultragreen monofilament, and rarely uses a leader longer than three to four feet. A longer leader is prone to picking up gunk off the bottom, and it reduces the action imparted to the twirling worm. 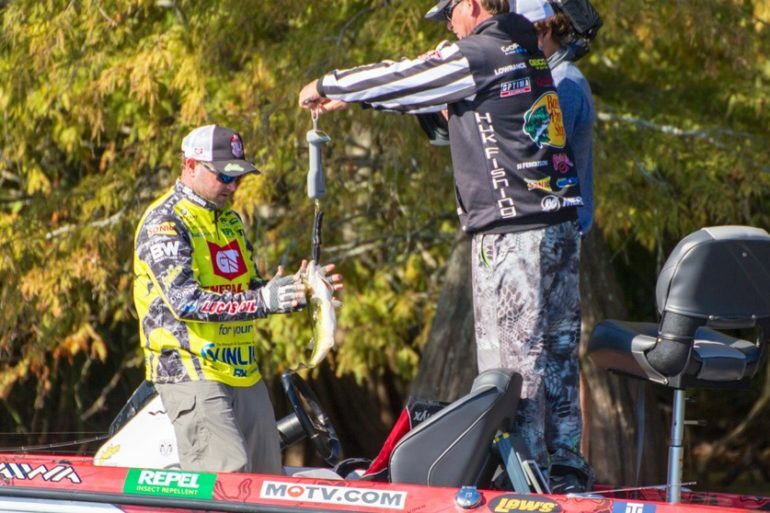 Parsons, meanwhile, employs a slightly longer four- to six-foot leader made of 10-pound-test Berkley Trilene 100% Fluorocarbon. He likes the sinking quality of fluorocarbon when the bottom is clean. Like Spaid, however, he’ll shorten up his leader if it hangs up on bottom, and opt instead for Trilene XT monofilament, which is less dense and floats. Butts uses the shortest leader of the bunch, rarely longer than 32 to 42 inches. And he sticks with 12-pound-test fluorocarbon for all his slow-death fishing. Regardless of the leader material you use, Spaid recommends leaving a 1/8-inch tag when you tie on your hook. That way, when you thread on a nightcrawler and pull the nose over the eye of the hook, the tag end will catch inside the crawler and hold it firmly in place. As I said, there’s nothing this amazing pioneer hasn’t figured out—including the best times and locations to use slow death. With the exception of suspended walleye, which tend to favour larger crankbaits, spoons and spinners with big blades, Parsons agrees that slow death works just about any time, anywhere. 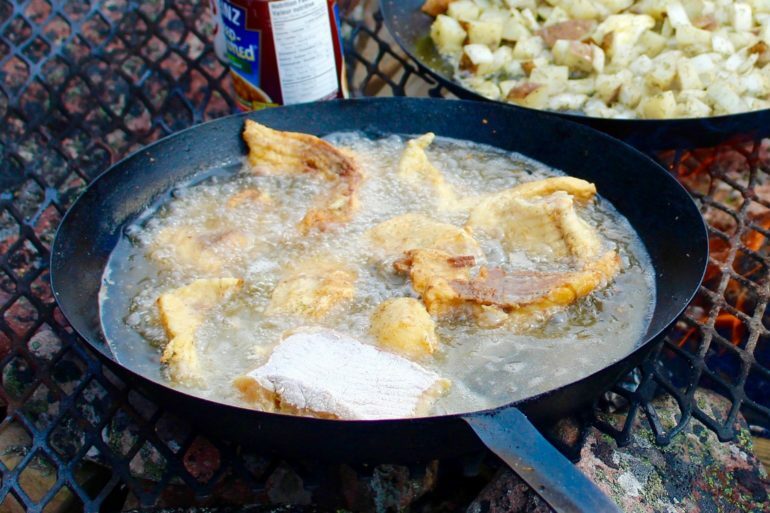 It’s especially effective, says the U.S. National Fresh Water Fishing Hall of Famer, when you find walleye near hard-bottomed structures, such as underwater points, reefs, humps, bars and shoals. 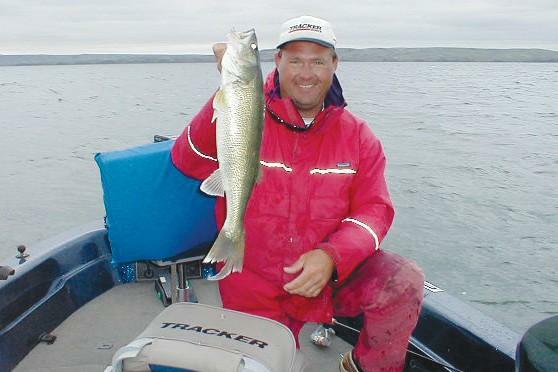 Parsons invited the angler to stay close to his boat and watch, and he netted five chunky walleye in rapid succession. Then he called him over to his boat, explained the slow-death method and even custom-bent a hook for him. The pro thanked Parsons profusely and pushed away from his boat—yet another satisfied angler geared up and ready to experience the action-packed tactic that is slow death. Walleye pros Dave Spaid, Gary Parsons and John Butts all favour baitcasting outfits for slow-death presentations. Parsons typically uses a 6½-foot BPS Walleye Angler Signature Series bottom-bouncer rod, but when other anglers are in the boat or he’s allowed to use two rods, he sets an 8½-foot rod in one holder and a 12-footer in another. The different lengths enable him to cover a wide swath of water without the worry of tangling lines. Parsons matches his rods with BPS Johnny Morris Signature Series reels spooled with either 12-pound-test Berkley Trilene Sensation or 10-pound-test Trilene XT. Spaid, meanwhile, uses a seven-foot, medium-action baitcasting outfit with smoke-coloured 10-pound-test FireLine. As for Butts, he prefers a 7½- to eight-foot St. Croix rod matched with a Shimano Castaic reel spooled with 10-pound-test Trilene XT. Slow-death creator Dave Spaid says to never use a bargain-bin bouncer when using his technique. Cheap bottom bouncers have brass swivels that don’t spin properly—they’ll twist your leader into a bird’s nest. Spaid also prefers bouncers with R-bend line ties rather than twisted loop ties, which have a habit of catching your main line. His favourite bouncer is Northland Fishing Tackle’s Rock-Runner, which has a quality snap swivel and stiff wire arms. The first time you thread a nightcrawler onto a slow-death hook, you’re going to discover it isn’t quite as easy as you might have thought. To properly thread on a crawler, you need to hold it gently with the head barely sticking out between your thumb and index finger—if you squeeze too tightly, the worm will squirm free. Next, push the tip of the hook into the nose of the crawler, and slide the shank through the worm until the nose covers the eye of the hook. Then pinch off the tail so about a third of the crawler is trailing behind the hook. To make things easier, slow-death inventor Dave Spaid recommends using a #2 hook rather than the smaller #4 and #6 sizes. Slow death is unlike the many walleye techniques in which you meticulously feed line to fussy fish and wait. Just ask the pros. According to Gary Parsons, practically anyone can catch walleye with slow death—you simply drag the rig behind your boat and hold on. And when you feel a fish, set the hook. As Dave Spaid succinctly puts it, “When they pull, you pull.” John Butts, on the other hand, lets the fish turn with the worm for a second or two before he sets the hook. Whichever the case, the pros all agree—hooking walleye on a slow-death rig is relatively easy.